Despite his unorthodox visage, Gérard Depardieu has made a profound mark on the acting world, earning a recognition as one of Europe's most accomplished performers and appealing leading men. Perhaps a contributor to his consistently intense performances, Depardieu's childhood was one of extreme poverty. At twelve years old, he dropped out of school and hitchhiked across Europe on an informal tour funded primarily by the profits of stolen cars and assorted black-market products. Depardieu would likely have continued in his juvenile delinquency were it not for a friend who was attending drama school in Paris. Intrigued, Depardieu enrolled at the Theatre National Populaire, where he studied his trade alongside future co-stars Patrick Dewaere and Miou-Miou. In 1965, the young actor made his debut in a French short film by the name of Le Beatnik et le Minet, and began making regular appearances on French television shows. By the mid-'70s, Depardieu had co-starred in 11 French films, though he wouldn't enjoy widespread success until his role of a nihilistic but lovable petty criminal in director Bertrand Blier's Going Places (1974). Not long afterward, Depardieu could be found holding his own against acclaimed French actress Isabelle Adjani in Barocco and portraying a passionate Communist organizer in 1900 (both 1976). In 1978, Depardieu re-teamed with Blier for the Oscar-winning Get Out Your Handkerchiefs, and he went on to win France's prestigious César award for his performance as a resistance fighter in The Last Metro (1980). After his portrayal of a 16th century peasant in The Return of Martin Guerre (1982), Depardieu played the title role in Danton, and he stepped behind the camera as co-director for 1984's Le Tartuffe. 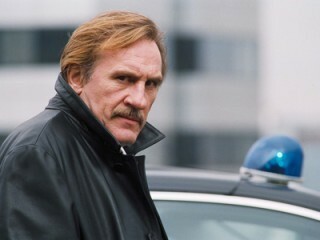 The 1990s were equally successful for Depardieu, particularly in the case of director Jean-Paul Rappeneau's 1990 version of Cyrano de Bergerac, for which Depardieu earned an Oscar nomination. He made his foray into American film in 1990's Green Card opposite Andie MacDowell . Though the bulk of his success still stemmed from French films (All the Mornings of the World , Germinal , A Pure Formality , and Colonel Chabert , to name a few) Depardieu nonetheless achieved moderate recognition in the American film market. Despite the failures of Ridley Scott's 1492: Conquest of Paradise (1992) and Steve Miner's English remake of My Father the Hero, Depardieu was praised for his performances in Kenneth Branagh's Hamlet (1996), Nick Cassavetes' She's So Lovely (1997), and Randall Wallace's The Man in the Iron Mask (1998), with Gabriel Byrne, John Malkovich, Jeremy Irons, and Leonardo DiCaprio. Over the following years, Depardieu maintained his prowess in film. In addition to critically acclaimed performances in The Closet (2001), CQ (2001), City of Ghosts (2002), and Nathalie... (2003), Depardieu began work with internationally recognized French director Alain Chabat for RRRrrr! in 2004. Additional appearances throughout 2005 and 2006 included the title role in Boudu (2005), Alain in Quand j'étais chanteur (2006), and Chef Didier in Last Holiday. Depardieu made his directorial debut with 2000's The Bridge. Depardieu has become somewhat notorious for his stormy offscreen life. He made a concerted effort to cut back on his alcohol consumption following a heart attack and an emergency quintuple bypass operation, in 2000. In 2003, he officially cut off contact with his son, Guillaume Depardieu when the young man threatened him with a gun and received a suspended prison sentence. On another note, the elder Depardieu was involved in both a plane collision and two motorcycle accidents as well (in 1998 and 2003), and officials attributed at least one of the incidents to abnormally high alcohol levels in the actor's bloodstream. In 2005, Depardieu allegedly scandalized European viewers when he crassly (and drunkenly) insulted a fellow guest on a French talk show for comments that the woman made about the cookbook he had authored. The aforementioned cookbook was no one-hit wonder for Depardieu. A highly-regarded gourmand and gifted enologist, he opened the Parisian restaurant La Fontaine Gaillon, on the second arrondissement, along with Buffet froid co-star Carole Bouquet in fall 2003. In October 2005, Depardieu publicly announced his intention to retire from screen acting, following his starring role in Michou d'Auber (2007). * 1996: Chevalier (Knight) of the Légion d'honneur. * 2006: Moscow International Film Festival: Stanislavsky Award for the outstanding achievement in the career of acting.